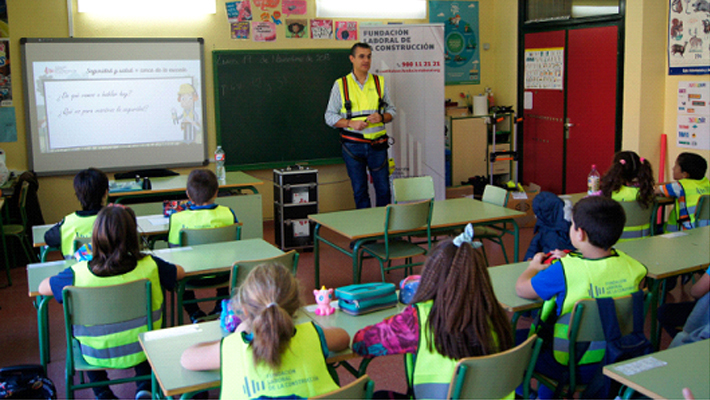 After the success of previous years, the Construction Labor Foundation continued in 2018 bringing the prevention of occupational risks to the smallest, through the campaign of ‘Safety and health + near the school’. Last year, more than 4,100 Primary Education students (6-12 years old) participated in this initiative, 48% more than the previous year, when a participation figure of 2,125 students was reached. Likewise, during 2018, the Autonomous Communities where the sensitization sessions were carried out were expanded, taking place in 14 schools in Agrarian, 36 in Castillo y Lean, 4 in Castillo-La Manchu, 18 in Communalism Valence and 8 in Galilean. Specifically, the joint entity carried out 32 days in Argon, 63 in Castillo y Lean, 5 in Castillo-La Manchu, 52 in Valencia, and 20 in Galilean. Through different informative talks, the youngest have learned practical examples and discovered similarities between the risks that can be found in the construction sector and the domestic risks to which they may be exposed. All this with the aim that the little ones feel familiar and motivated to introduce small safety routines in their day to day. So I have prepared reflective materials for everyone. During the sessions, the technicians of the Foundation showed the students the different personal protection equipment (EPIs), and they answered the possible doubts that could arise. Also, each of the participants received a reflective vest with reflective tapes. On the other hand, young people participate in a writing and drawing contest on safety and health, in which, choosing a risk situation, they explain what preventive measures can be adopted to annul or reduce said risk situations. The campaign ‘Safety and health + close to the school’ is financed by the Joint Body for Prevention in Construction (OPPC) and the actions are totally free for the schools that are visited.